Image caption How much cowbell is too much cowbell? Life in an orderly and peaceful market town in southern Germany has been disturbed by a long-running legal battle – over cows and cowbells. 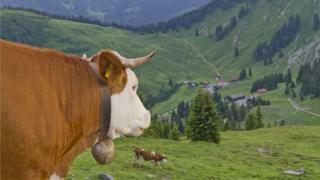 A married couple who bought a large house in the fields on the edge of Holzkirchen, south of Munich, are suing a farmer over the clanging cowbells on her cows, which graze in a neighbouring meadow. When they first moved into their house in 2011, the field was empty, but in 2014 it was leased to Regina Killer, who runs a small dairy farm. Mrs Killer says cowbells are part of both Bavarian tradition and her livelihood. The husband lost his original lawsuit against Mrs Killer in 2017. He is appealing against the decision at a court in Munich. His wife has now launched a second lawsuit against the farmer. They have also sued the local council for leasing the meadow to the farmer for grazing. The cowbells clang day and night, the couple told the court - causing them to suffer depression and sleepless nights. They also argued that making cows wear a loud bell amounts to animal cruelty – and cowbells are not necessary in flat, open countryside. "Have you ever seen a cowbell in Holland?" the court was asked. The cows should be given GPS trackers instead of bells, they argued. Mrs Killer and her legal team maintain that cowbells are there in case the animals escape - they allow the farmer to hear where they are, even at night. GPS trackers, meanwhile, are expensive and still in an experimental phase, they argued. And Mrs Killer has plenty of support. "This is the countryside - cows and cowbells are part of our tradition," one local resident said of the row. Another agreed: "People have to accept that we have farms around here - with cows and dung. "That's how we have fresh milk." But one resident simply said: "I don't think we should give opinions about this - you never know exactly what's happening if you aren't involved." "There are always two sides to a quarrel." The mayor of Holzkirchen, Olaf von Löwis, is equally diplomatic. "What is at stake is whether cowbells can be considered an appropriate part of agriculture in our region," he said of the row. "The other question in this context is how far should the keeping of animals be seen as an objective disturbance," he added. He knows the problems: emissions (excrement and odour), and their effects (flies and insects). But "grazing is a common practice in our area and is an important pillar of agriculture", he said. A decision on the second lawsuit, brought in by the wife, is expected at the regional court in Munich in January. For now, there is no cowbell noise: Mrs Killer's cows spend the winter months in sheds.